Living in the San Joaquin Valley – in the heart of California – has it’s perks: centralized locale, mild weather, and fresh fruit. But one thing the valley isn’t known for is clean air. Smog is a way of life here. This is why many people take short drives to the coast to get some “fresh air”. On the way back, after driving over the coastal mountains, the valley air is usually so thick that the beautiful Sierra Nevada mountains aren’t visible even though they are only 30-40 miles away. Only when you get across the valley and within a few miles of the foothills can you begin to see the high snow-packed peaks. In contrast, when my family and I drove across Arizona and New Mexico earlier this year on I-40, we could see pretty plateaus shooting out of the dessert ground. These mountains seemed to me only a skip, hop, and a jump away. In reality, many of these peaks were more than 50 miles away, on the other side of vast, sprawling, dessert valley. In my last blog, Greatly Inflated Expectations, I pointed out that the primary drivers of growth – productivity gains and population growth – are trending down. As a result, banks are likely to keep their massive amounts of money reserves “on the sidelines”. With credit relatively limited and growth muted, inflation isn’t likely to rise significantly any time soon. But what about interest rates? Is not the Federal Reserve actively “raising rates” as the newsfeed reports? The short answer is no, but more on this in a moment. 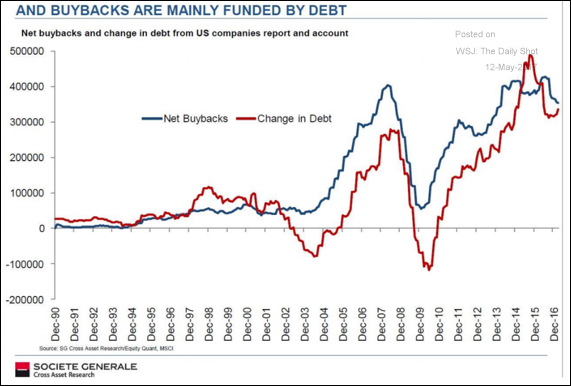 …and the corporate debt has been used mainly for one thing: share buy backs. That is, corporations are going into debt to buy back their own stock. This limits the supply and drives up the price of their stock. And it is in the context of this financial engineering, slow growth, and lower inflation that we see the eventual downward direction of interest rates. While we still expect interest rates and inflation to rise significantly at some point in the future, we view that mountain range as still a ways off. And in order to climb that mountain, we will first need to trudge through the valley. I said inflation has been and will continue to be relatively low. That is generally true, but not entirely. As indicated by the graphs above, we have experienced rising prices (inflation) in stocks, corporate bonds, and real estate over the past 9 years. The manipulation of the free market by the “price fixing” of money at the Federal Reserve has served to misallocate capital. This has led to the appreciation of only certain assets, driving up the wealth of the upper-class. Imagine the global investment landscape as the New Mexico dessert – almost entirely in a hot valley with the exception of isolated dessert plateaus thousands of feet high. If you are one of the “ordinary” people – hanging around in one of those valleys – don’t be too envious, though. Those who have ascended to the top of one of those plateaus should be prepared. There is, after all, an abrupt drop on the other side. As a result of the concentrated prince inflation in these assets over the past ten years, it is precisely these assets which will endure the brunt of the deflationary pain of dropping prices in the next recession. So what will be the tipping point that takes us down into the valley? What is the catalyst for the beginning of the recession, stock market correction, and asset price reset? It’s difficult to say exactly since the economy is infinitely complex and a bubble can burst for any number of unapparent reasons. However, one possible catalyst is forming right before our eyes – the Federal Reserve’s current policy of raising rates. The best way to end a credit expansion is to limit the availability of credit. And the best way to shore up the availability of credit is by raising interest rates. This is exactly what the FED is doing. 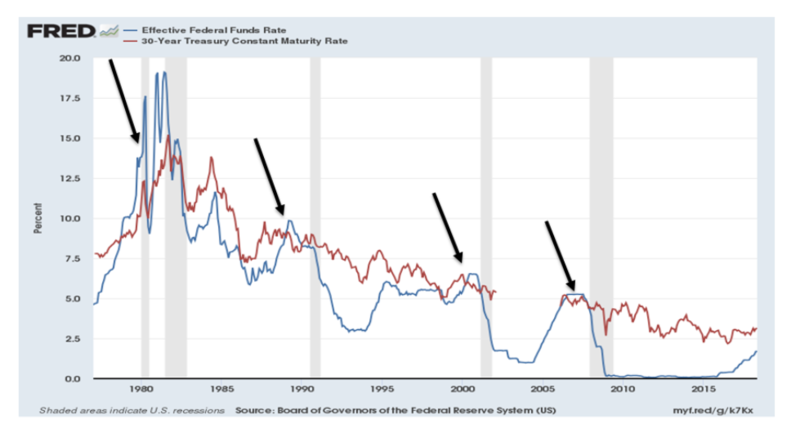 Simply put, although we expect interest rates to go down over the next few years because of an ensuing recession, the immediate cause of this recession may be the Federal Reserve’s insistence on raising rates now. As the Federal Reserve continues putting upward pressure on interest rates, this will set in motion a chain reaction. As interest rates go up, the ability of all the highly indebted individuals, corporations, and governments to service their debt will be diminished. This will, in all likelihood, lead to higher defaults and an economic slowdown. One good illustration of this process is what economists call “the yield curve”. Over the past two years, the interest rates on short-term governments bonds have increased from 0.25% to 1.75%. This is a 1.5% increase in just over two years. Meanwhile, the long end of the “yield curve” – 30 year Treasury Bonds – has remained essentially unchanged. This represents a significant “flattening” of the yield curve, which could be a precursor to an “inverted” yield curve. Over the past 40 years, the only consistent indicator of impending recession (shaded gray) has been an inverted yield curve. This occurs when the two lines above cross each other. The curve isn’t yet inverted – that much is obvious. But if the FED follows through on raising the short end of the yield curve, an inversion will likely occur. The yield curve isn’t some magical, voodoo type statistic that just “works” for some reason. The reason the inverted yield curve is useful in forecasting recessions is because of what it tells us about investors. It makes no financial sense for investors to purchase long-term debt at lower interest rates than short-term debt. This means they are doing it for another reason – namely, fear. It means they want to “lock-in” long term interest bearing debts of the US government because of the perception of safety from default. Locking in long-term US debt is a good decision when one expects interest rates to decline (due to Central Bank pressure) in the midst of a recession. In short, an inverted yield curve suggests investors are getting sour on the economy. This is the value of the inverted yield curve, and it is worth watching. It is a great irony of today’s economic environment that the FED’s insistence on raising rates may well be the catalyst for their eventual decline. Successful investing requires a disciplined process. This process serves as an anchor when tempted to abandon ship in the midst of an disorienting tempest. But conviction in the midst of ignorance is just as dangerous as blowing with the wind of prevailing wisdom. Both typically lead to the wrong destination. What is also crucial is an understanding of economic fundamentals and the ways in which the powers-that-be manipulate them. For example, interest rates should be higher today based on weak economic fundamentals. And yet, as economic fundamentals weaken, the FED will likely lower interest rates rather than raise them. They will do so not because they should for the good of the economy. Nor because they need to. Rather, they will lower them because their prevailing (Keynesian) paradigm demands it. Understanding economic fundamentals is important. Understanding the Fed’s (mistaken) paradigm is just as important in navigating the storm brewing on the horizon. At Plan Financial, we work to help our clients navigate the oddities of an economy largely in crisis containment mode. We do so by identifying the opportunities in an ever-expanding global marketplace. These opportunities provide our clients with consistent and reasonable returns. This, more than anything else, is what allows our clients to achieve their objectives.